This page presents a user-friendly overview of TinyWall's version history. A detailed changelog can be found here. Upgrade note: Your firewall rules will reset when upgrading to this version the first time. To keep your settings, please export them before and import them after the upgrade. Removed automatic network zone switching. Ability to disable global shortcuts, as well as numerous other usability enhancements. Upgrade note: It is vital that you uninstall TinyWall 1.0 before upgrading to this version. Easier first-time setup. The search for most recognized applications has become blazing-fast and TinyWall will automatically whitelist known and trusted applications when starting for the first time. Added new learning mode. In this mode TinyWall will observe what applications use the internet and how, and remember them in normal mode. Setting up complex applications or a freshly installed system becomes a piece of cake. Just start learning mode, use the applications, then switch back to normal mode. A greatly rewritten firewall exception dialog. No more confusing profiles, only a streamlined and simpler interface and a direct possibility to manually specify ports. 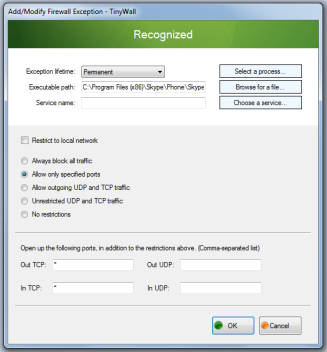 The ability to restrict applications, one by one separately, to the local network. TinyWall 2.0 installs and uninstalls like any other application. By common request it can now be removed from the Control Panel. Better support for built-in Windows features. TinyWall 2.0 can now be expected to work well and be compatible with Windows Networking, Remote Desktop, Remote Assistance and other network-related Windows features. Easier whitelisting of complex applications by recognizing related files. 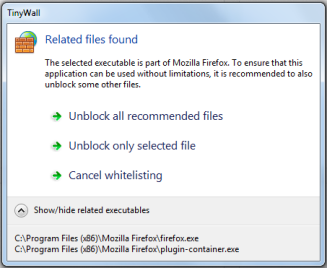 If an executable needs additional files whitelisted to work correctly, TinyWall will automatically notify and offer you to whitelist those files when you try to unblock it. Hosts file protection. A common web-related attack by malicious code is redirecting the user to fake sites to phish data or install further bad code. TinyWall will lock the hosts file to ensure its protection and prevent malicious redirection using the hosts file. Mouse picking of windows with higher privileges. In v1 when TinyWall's controller was not running elevated, it was impossible to whitelist another application that is running with admin rights by mouse picking (by window). You either needed to use a different method or you needed to elevate TinyWall too. TinyWall 2.0 allows you to whitelist most admin applications by window without having to elevate TinyWall itself. Saving of settings without breaking existing connections. TinyWall will no longer break existing TCP connections when applying firewall settings. New updater system. The updater now supports updating not only the application, but also the data components separately. It will naglessly keep your hosts file (if enabled) and the recognition database up-to-date without you having to install new versions of TinyWall. Traffic rate monitor. This is a feature in the form of a tray menu entry that will always tell you the current total download and upload rate of your computer. Connections window shows blocked applications. The Connections window will now optionally show you what the firewall has blocked recently, and a right-click menu allows you to either unblock or close processes. Even multiple at once. Increased performance. Reorganized code and a parallelized load process make TinyWall 2.0 start much faster than earlier versions and firewall settings take less time to apply. Remember the last used firewall mode. TinyWall 2.0 saves the firewall mode between reboots (with the exception of the Disabled and Learning modes, which will not be remembered). Digitally signed applications executables. All binaries shipped by TinyWall are signed using a recognized digital certificate. A digital certificate assures users that the author is no fictional person and it will identify all software releases coming from me. It means that as long as Windows is telling you that TinyWall has been published by "Károly Pados" and that it is valid certificate, you can be sure that the TinyWall you have downloaded really is from me and that it has not been compromised by others since its release. Localizability. The interface in 2.0 can be translated to other languages, as of 2.0 a French translation is included in the distribution. Improved support for accessability, keyboard navigation and screen readers. Support for running in a virtualized environment. Support for quickly filtering the list of application exceptions. Makes it a breeze to search for something in a long list. From the Connections window, you can easily initiate searches for processes on VirusTotal, ProcessLibrary and Google. Support for Windows 8 (tested on CTP) and .Net Framework 4.